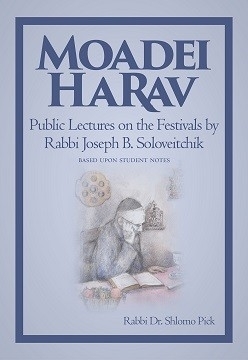 Moadei HaRav presents a collection of shiurim and lectures (based upon student notes) by Rabbi Joseph B. Soloveitchik on the Jewish festivals, including the High Holidays, Chanukah, Purim, and Passover. Rav Soloveitchik was not only one of the outstanding Talmudists of the 20th century, but was also one of its most creative and seminal Jewish thinkers. 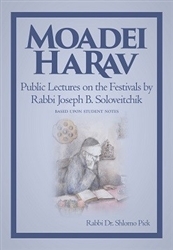 Through these shiurim and lectures, along with his own original essays on Jewish laws and rituals, Rabbi Dr. Shlomo H. Pick provides the Rav’s insights and thoughts on the Jewish holidays. An introductory essay analyzes the Rav’s methodology of Talmud analysis.